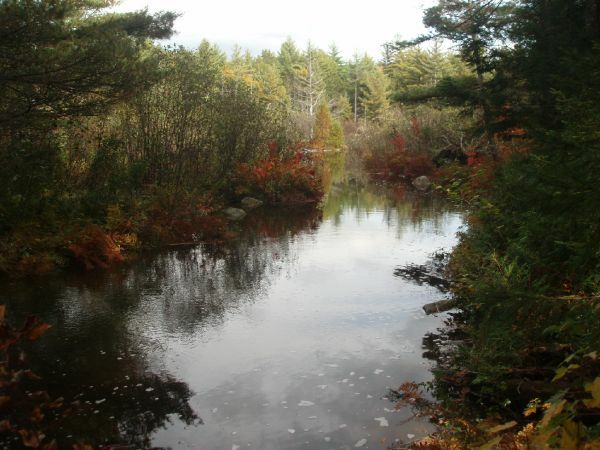 This blog is my place to sit and toss pebbles into the stream. The stream of Life relentlessly passing before us. We can affect it little. For the most part I just watch it passing and follow the flow. Occasionally, I need to comment on its passing, tossing a pebble at it to enjoy the ripple affect upon Life's surface. Could Winter be far Behind? Well, finally we got a little snow that might stick around. Last night there was some freezing rain and then some snow (the ice crystal type). This morning the temperature is -10C. Today will be beautiful with clear skies and sunshine to contrast with the white snow covering the ground. Looking up the road. How about a visit! My backyard. Hey! what happened to all the wood I had piled. I have started my wood cook stove to warm the kitchen. The cats seem to like it as a place to keep warm. I managed to move the wood into the basement before the snow. I will need more but this should get me through until March. I will be skidding the rest out of the bush soon so I can work away on cutting, splitting and piling it outside. Time to rush out and make an angel in the snow. :) Don't you just love Winter! I shall be thinking about family and friends in the United States as the are sitting down and sharing the traditional Thanksgiving feast. As usual, I will read some passages from Bradford's Journal to focus my thought on that "First Thanksgiving". I have many memories of my years in the United States sharing this holiday with American friends. They were great occasions for me. 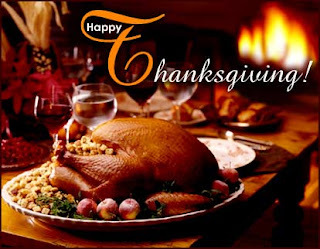 It is hard to fully appreciate Thanksgiving as it celebrates an ideal rather than a reality. "Freedom and justice", is an ongoing struggle. It should be a sadness to us all that one great Nation was created at the price of the destruction of the people and culture of the Nations of the native Americans. They are owed a debt that can never be paid. My sister, Penny, recently finished hiking the pilgrimage trail in Spain, El Camino de Santiago de Compostela (The Way of Saint James). This is an ancient pilgrimage to the Catholic Church in Compostela, Spain, where the bone of the apostle of the disciple James are preported to be buried. There are in fact many routes of this pilgrimage from the south, the East and the North and along the west coast of the Iberian peninsula. Penny followed the main route from France. Here is an interactive map of the route. Last year, Penny, travelled part of the Camino with her daughter, Elizabeth. This year she returned to hike the rest of it. 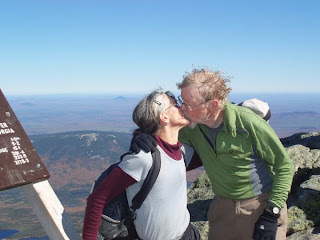 Her husband, David, joined her for two weeks at the beginning and she met up with Elizabeth along the way to take a few days off to spend time together. Otherwise, she was a solitary pilgrim for most of her 42 days on the trail. Below is a sellection of photos taken along the Way. "Everyone's Camino experience is personal; no two are alike. The Way is a metaphor for the journey of life. It has many trials and tribulations but at the same time many joys and successes. I think most people could do this hike; but, it is not easy. I think one of the secrets for success is to discover what the best speed is for you and to stick to it. David and I settled on 15 km a day. That was below the average but it was best for us. Much of the Camino is up and downhill; sometimes just a slow steady climb that seems to last for hours. The terrain underfoot is varied but a lot of it is pavement or gravel; both very hard on the feet. The nicest is to walk on a cushy woodland path. Occasionally, the downhill of a mountain is sheer rock. This was very tough for me but I just took my time and descended carefully and slowly. I used walking sticks even in cities as I can fall very easily and one of my goals was to not have any falls. The climate can also be a challenge depending on when you go. In the summer you have to cope with extreme heat; spring and fall you can get rain; winter is dangerous in the mountains and on the plateau it is windy and cold. So one has to think about one's feet, the weather and the terrain. I was very lucky and had only a few days of rain and only one day when it rained heavily all day. Some days in Sept. were too hot for David and me. I had a couple of days when I knew I had had too much sun. 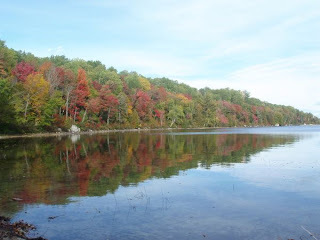 As I walked West and into Oct the weather became Fall with cool mornings and nights but warm afternoons - very pleasant. It is so liberating to get off the treadmill for awhile and have time to think. I think this is what I appreciated the most. You have time to reflect on your life - where you have been and where you are going. While David was with me we had time to communicate at a deeper level and rediscover how well we work as a team. There is nothing else to think about but putting one foot in front of the other, what and where you will eat and where you will sleep. All we needed was carried on our backs. We were out of the loop of the 24 hour daily soap opera that the news has become. What a joy! After only a few days we had completely relaxed and any tension in our faces was gone. This of course had the happy effect of making us look younger. When life is stripped down to the basics and you walk through pain and discomfort you have the opportunity to reflect on what is truly important in this life. Many are on the Camino to find healing from a broken relationship or to reorient the direction their life and/or career has taken. A close bond develops with perfect strangers because of a common purpose and shared goals. The camaraderie is tangible because everyone wants to help the others achieve their goal. The Camino isn't just any old hike. It has both antiquity and a spiritual component that sets it apart from other hikes. I'd say most people on the Camino are not religious in an institutional way but many are searching for spiritual meaning to their lives. Even those who don't start out with this purpose find themselves falling under the spell of the ancient pilgrims who passed this way. The antiquity is what first attracted me but by the time I started it I also wanted to enhance my spiritual life and put some of life's blows into a broader perspective. Now I have learned the Camino is even older than what I knew. The bones of the oldest European man (1.3 million years) have been found near Burgos at Atapuerca on the Camino. Moreover the director of the project believes they have not yet made their biggest discoveries. So people have wandered along at least some of this path for over a million years, as well as Celts and Romans etc. At a deep gut level one starts to feel connected with all the humanity that has preceded us for longer than we can get our head around. We realize that we are just a speck in the Grand Plan, whatever that may be. The Camino is so rich in art and architecture. Every little village has a church, frequently dating from the 11th or 12th century with much history behind it. There are many rivers in this part of Spain so there are also many Roman and medieval bridges gracing the rivers. Medieval monasteries and hospitals run by religious orders dotted the Camino at one time and today some still stand but are used for other purposes. Famous people have passed this way; Charlemagne as a warrior and St. Francis Assisi as a pilgrim. Millions of peasants a year followed the Camino to Santiago before the Reformation. There are ancient accounts of the pilgrimage that people still refer to today. Myths, legends and historical facts abound along the Camino and this all works to make the Camino feel a sacred path. For the first time in many years I feel truly rested and at peace. It is a wonderful feeling. Walking the Camino is one of those trips that becomes even better when one's memory has time to think about the experience more. I truly hope the effects of my experience will be lasting." Santiago Matamoros (Saint James the Moorslayer). In a time when Muslims are becoming prominant in Europe, those who see them as a threat call upon this patron saint of Spain to rally opposition to Muslim expansion into Europe. Years before Saint James showed as a "Spirit Warrior on a white steed" to inspire the Christians who drove the Muslims out of Spain in 1492. Those who want to welcome Muslim into western Europe are somewhat embarassed by Santiago Matamoros and try to downplay his role in the persecution of Muslims so many centuries ago. I look forward to discussing , in person, the pilgrimage with Penny in all its aspects from a trip across some interesting georgraphy filled with interesting history and the personal and spiritual experience for her and others. My mother would have enjoyed this day. She was very fond of the Royal family, in part because her mother and father were English but also because she admired how they served the British peoe in the Second World War. They were an inspiration then and a symbol of national unity during the darkest of days. She could forgive individual member's shortcomings, and their were many, made trivial in the light of the stature of King George, the Queen Mum, and Queen Elizabeth II who exemplified "doing one's duty" for the country and the Commonwealth. 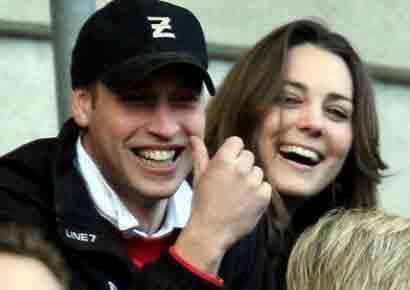 Prince William is one of the shining lights in the Royal family. He has his mother's good looks and charm. He has been raised to become king some day. In the meantime, he has begun a military career, gotten involved in charities, taken on some modest official duties, when asked, and been an enthusiastic sportsman. All qualities expected of a Royal. I was touched to learn that he gave his future bride his mother's engagement ring. It is lovely and was unusual at the time but became popular. The last time I thought I might get married it was a Princess Di ring I chose. It is nice that they will live in Northern Wales. He is posted there with the Royal Air Force. As a bit of a royalist myself I often think it would be nice if a member of the Royal family came to live in Canada for a while. Prince Andrew would be a nice choice as he went to school in Canada as an exchange student at Lakefield College School. Now to convince a Prime Minister to consider asking him to be our Governor General at some point in the future. I am told it would never happen for political reason but one can dream. Hopefully, when they are married the happy couple will visit Canada. "Got me a good one !" A handsome and happy young couple. May they carry the weight of the life they face together, admirably, lightly as well as dutifully. It is a long time since I felt motivated to create in my kitchen. It is often hard when you live alone to get motivated to cook, bake or put up preserves. You fall back on quick "meals" grilled cheese sandwiches, bacon and eggs, KD (Kraft Dinner) and far too many meals made up of a bowl of popcorn. It began when I could not pass the reduced price of over ripe bananas in the Coop. I decided to bake some banana bread. That turned out well, as it always seems to do for me. I then thought I would enjoy some oatmeal cookies. I saw a recipe online of some soft oat meal cookies that are made large and served with some vanilla ice cream on top. I love vanilla ice cream so this caught my fancy. I picked the last of my onions a couple of weeks ago. There were some small ones which I thought would best be made into pickled onions. They should be ready for Christmas. Finally, I have had navy beans in the pantry for quite a while and I finally remembered to purchase some molasses so I decided to make some Boston Baked Beans, a great comfort food. How long this attack will last I do not know. I know where I can get some beets and carrots to pickle. I guess I will do that next. Who knows where it will lead. Can baked bread be too far off? Time for some Baked Bean,s coffee and an oatmeal cookie. Yummmm! 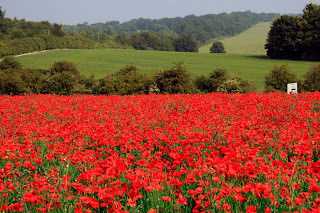 Remembrance Day if you prefer. 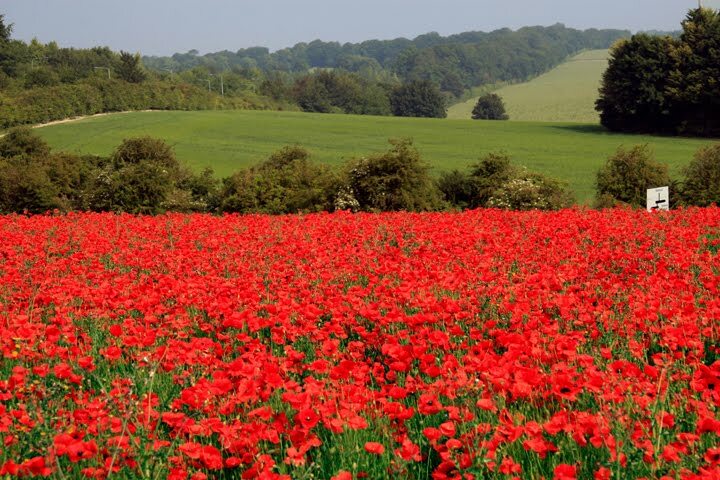 I prefer Armistice Day as a reminder that it is the anniversary of the end of the Great War, the First World War, "the war to end all wars." Sadly, it was the beginning of a century of wars. This year is the first year Canada celebrates this day without a living veteran of the First World War. It is a very emotional experience to visit the war memorial at Vimy Ridge and the Menin Gate Memorial at Ypres. So many died in the battle of Vimy Ridge and the several battles around Ypres Of them, thousands of soldiers remains were never recovered. It was dirty dirty trench warfare, hard to imagine.. . . so many bodies whole or in parts just disappeared into the mud where they landed. Militarily Canada has had its proudest moment in this part of France and Belgium in the two world wars. The many war cemetaries that dot the countryside stand witness to the lives of countless allied soldiers. In effect all of this countryside is a mass grave. A copy of "In Flander's Fields" in John McCrea's handwriting, enlarged on the wall of the Flander's Field Museum in Ypres, Belgium. My uncle ,Ross Reid ,was a pilot in the Second World War. He is the handsome lad in this picture second from the left. He survived the war but so many did not. 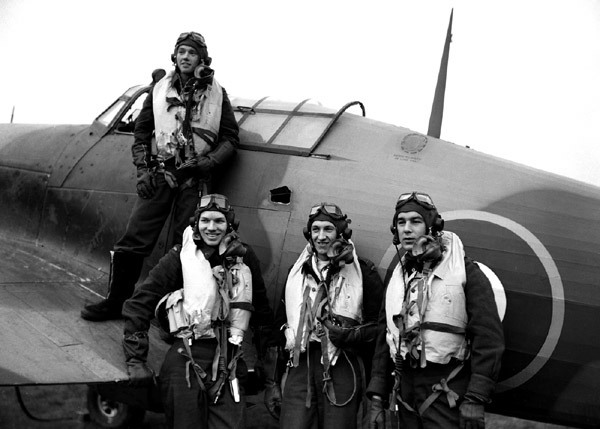 The two pilots on the left and right of this pictured died shortly after it was taken. I remember my Uncle Ross today. I admired and enjoyed him growing up and as an adult. He married, my Aunt Billie, just before he left for the war, and luckily he returned to live and raise a family. 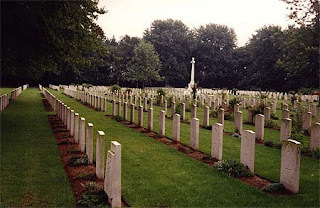 This is the Canadian War Cemetary at Adegem, Belgium. Here are buried 848 Canadian soldiers, most of whom died liberating the south bank of the Scheldt Estuary. We remember! We also must be painfully reminded of the lessons we have not yet learned that find us still sending our youth off to die in foreign lands, none since as noble as the cause of the First and Second World wars. 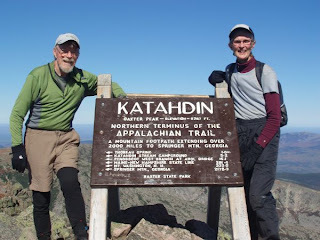 My brother and his wife finally posted some pictures of the end of their trek of the Appalachian Trail. The terminus is on top of Mount Katahdin, a mile above the central Maine Woods. 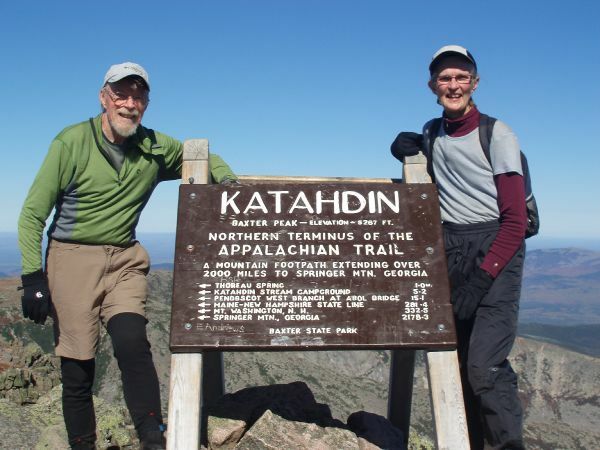 Their trek ended October 5th after beginning March 17 at Springer Mountain, Georgia. This is the required photo with the iconic sign. This was the required kiss for the "Canadian Geese"
A Maine woodland scene along the trail. Autumn in Maine. Maine is very much like my part of Ontario, sans mountains. The scenes of the forest and mountain recalled for me reading Henry David Thoreau's adventures into the Maine Wood. He visited Mount Katahdin in mid 19th Century. Here you can read some of his observations. To view more photos of the last postings of their trek go here and move forward or click of the last photo and back up. A note from my brother indicates they are recovering physically and psychologically from the end of their adventure. There was even a suggestion of another hiking adventure next year! I have managed to transform the logs we skidded out into about 3 cords of wood ( 9 face cords), cut, split and piled. It is a sunny day so I rolled back the tarp to get some sunshine to help cure the wood. We have been enjoying some nice weather hovering around 0 C, a little snow and some lovely sunny days like today. I will be ejoying a little rest until we skid out some more wood, hopefully on the weekend. I am about half way to what I would like to have on hand for wood for the Winter. I at least need to retieve the trees I have already cut down in the bush. During a recent high wind I could hear some trees blowing down in the bush. I may have to salvage them as well. You can never have too much firewood! I am very bad at piling wood. It is an art form around here which I have never mastered. A secondary reason for the tarp is to hide my piles, from my more skilled neighbours. I think it is a sure sign that I am an outsider around here ( having only been here 30 years). Invariably one or more of them will fall and have to be re-piled even before I move the wood into the basement. I love the clouds on days like today. I feel I am getting stronger as I go with this wood work. I guess I am recovering some conditioning. I wonder how much wood I would have to chop before I loss some weight? Of course, weight is an advantage when you are swinging a maul to split a block. This is an invigorating time of year with the cooler temperatures, the anticipation of the coming of Winter and snow and a sense of panic for not having do all that you should to be prepared for the colder weather. Pin this badge on your site. Learn to Type Online for Free! What Breed of Dog Are You at Work?